A new preprint is out in the arxiv today, detailing the results of a new analysis of neutrino speeds performed by the OPERA collaboration using proton spills of the CNGS beam produced during dedicated runs in May this year. If you have missed the whole saga of superluminal neutrinos last Fall (on which planet were you then ?) it is hard for me to fill you in, given my dislike for rewriting the same things over and over again beyond the decency line. Maybe the best advice I can give you is to search for "OPERA" or "superluminal neutrino" in the search box on the top right. That way you should be able to find a few articles I wrote on the matter in the course of the last 14 months, with more detail than you can chew over a weekend. So let me assume you are up-to-date with the status of things. You just need a three-line reminder to get to full speed: Opera's claim caused a stir in the HEP community, a lot of mediatic interest too, and then fizzled out when two previously unaccounted-for systematic errors were unearthed, one of which caused by a loose cable. Science progresses by trial and error, and this is no exception. The measurement of the speed of neutrinos was admittedly, to a good extent, a fishing expedition: everybody is sure that they travel at the speed of light or just a tiny bit less than that (a undetectable difference), so searching for a deviation from the prediction was like buying a lottery ticket. The former Opera spokesperson Ereditato thought last year he'd won that lottery, and if I read the story correctly his bad judgement -going public when they should have performed more checks- was the source of all the media attention and the bad PR aftermath. Uncharacteristically for a country like Italy, he paid for that mistake. But the measurement of the speed of neutrinos is not just that. It is a physics measurement which is both possible with a minor effort given the availability of dedicated technology (built for other purposes -most notably the measurement of tau neutrino appearance in a muon neutrino beam) and interesting. Its interest at least in part is due to the challenging task of performing a timing measurement with nanosecond accuracy by correlating events at 730 km of distance. The required technology and methods are useful stuff! So, even now that we well know that neutrinos are indeed perfectly compatible with traveling at light speed as they should, the effort of measuring their speed with as much accuracy as possible is a well-spent one. The paper describes the measurement, which is performed on a total of 104 neutrino interactions collected by Opera from the dedicated narrow-bunched proton spills at CERN. I will not go through the details, but if you are interested in them you are well advised to read the paper, which is short and, for the most part, absolutely readable even by non-experts. Here suffices to mention that four different techniques have been employed, each using a different subset of the 104 interactions. Both the earliest hit and the full set of hits are used in methods 1 and 2 respectively; method three exploits the presence of a well-reconstructed muon track; method four is the most precise, and exploits new hardware that has designed for the explicit purpose of improving the precision of the measurement. 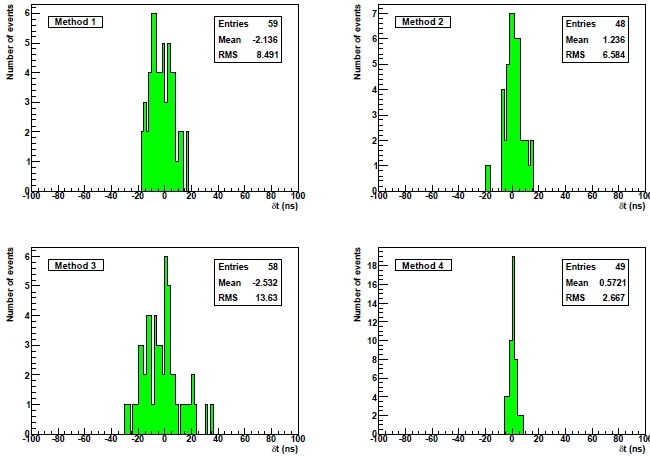 The figure below shows the timing measurements provided by the four methods. The spread around zero of the distributions betrays the different variance of the methods. The new hardware provides indeed a significant improvement, as shown in the top right panel. The results are then combined into unsurprising summaries: for neutrinos, the difference between their detected arrival time and the expected one is measured to be 0.6 +-0.4 +-3.0 ns; for antineutrinos, the difference is found as 1.8 +- 1.4 +- 3.2 ns. Both are clearly very well compatible with zero.